Yola – is one of the first website builders that have become available to the large audience. Launched in 2007, the system has revolutionized the entire web design approach, making it much simpler and more understandable for non-techies. Since the date of its foundation, the website builder has changed a lot. With new features, tools, web design elements and templates, the service has gained worldwide popularity. Yola has been around for quite a long period of time, but is it still competitive? What new features and advantages does it offer and are there any special nuances that make it stand out from the crowd? We won’t make any assumptions regarding these aspects. Instead, let’s take a look at the major Yola highlights (and, obviously, its downsides) that will help you decide whether the system works well for you or not. If you have ever tried using Yola, then you couldn’t but noticed that its interface looks somewhat outdated as compared to modern website builders. Right after the registration (which is rather quick), you get access to the dashboard and this is where you’ll face multiple questions right from the start. The thing is that it’s not quite simple to understand the initial implication of the sections and find those you actually need to get started with your project development. It definitely takes time to explore all the categories and options available in the dashboard. What’s more, we can’t say we enjoyed the drag-and-drop editor of the system. It’s more restrictive than that of Wix, for instance, and it takes some time to get used to it and understand its logic. The builder does support dragging, but you don’t have full control over the elements – when you drop them, they simply jump to pre-determined invisible boxes. 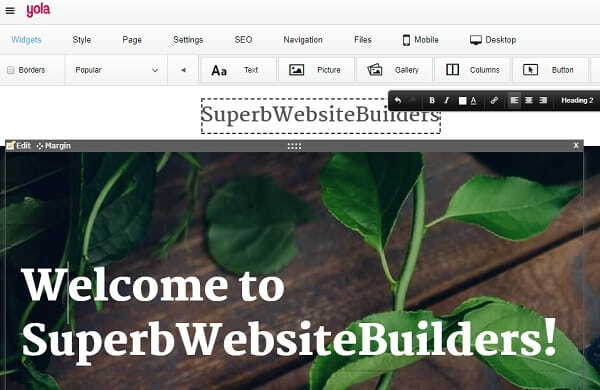 Just like any other modern website builder, Yola lets you create the website structure and layout by adding, arranging and modifying multiple content blocks. These include structure elements (buttons, content blocks, galleries etc.) and widgets (mp3 player, videos, commerce, Facebook comments and more). Yola lets you choose and integrate a variety of tools, widgets and external systems. Thus, you can integrate with regular contact email marketing services, Tumblr blogs, Google App Suite, PayPal support services etc. Unfortunately, there is currently no integration with eCommerce marketplaces and platforms, CRM services, helpdesk and accounting platforms and other important external systems. The system empowers premium plan users to get the most out of the advanced Mobile Plus feature. It lets you view and modify the mobile version of your website with a few clicks. Take your time to specify your business hours, provide maps and directions and let website visitors get in touch with you by tapping the screen to give you a call. That’s simple and quick. The system allows synchronizing your Yola account with popular social media services like Facebook and Twitter. This does not only contribute to the functionality of the service, but also helps keep users aware of all the changes, updates, events, news and special discounts the system has to offer. Setting up a web store with Yola is not difficult at all as the system has a powerful integrated eCommerce engine. To use it, however, you need to upgrade to the paid plan. You can also create a web store with Yola by integrating an Ecwin plugin into it. 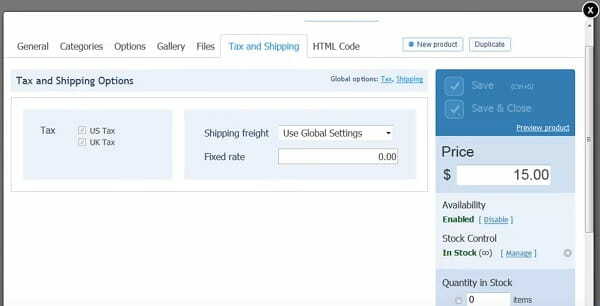 The eCommerce feature lets you sell products 24/7 in the online mode by setting up the integrated shopping cart, selling up to 1000 products, connecting your Yola web store with Facebook account, getting access to the system’s dashboard, creating and modifying the show window, making use of CSV product import/export file etc. The engine also supports multiple languages and integrates with international and local shipping providers, such as FedEx, UPS, USPS, DHL and more. Yola allows accepting credit card or PayPal payments, integrating with multiple payment gateways, setting up sales taxes for your products based on the geo location factor. Users have a nice opportunity to launch a flexible web store, offering complete control over the products and their categories. They can create and save shopping profiles, manage online inventory tools, track orders and get in touch with customers. Yola websites are not currently available in many languages – there is only a chance to add a Google Translate widget to the website to make your project available in several foreign languages. There is no special tool to create multilingual websites or language localizations here by now. With Yola, you can connect and manage widgets to give your website more advanced design and performance. The majority of widgets, though, are not built-in, but are the third-party integrations. No App Store granting access to widget collection is available here as well. To give your Yola-based website better search engine results, the system lets you fill out and customize meta tags for all pages. These include titles, descriptions, keyword etc. There is access to the separate menu part, where you can create and change URL text to make it user-friendly. Yola doesn’t support forum creation option. If you still need a forum for your website, then you’ll have to create it on a separate subdomain of the system, using specialized forum engines and tools. Obviously, that’s not quite convenient, so, it would just be simpler to use one of the website builders that provide this feature out-of-the-box. You can install a flexible, convenient and easy-to-use contact form builder to create any online forms that can be applied at your website. This is one of those features many contemporary website builders currently lack. With Yola, you can individually edit your website code, if you have good command of HTML basics. The feature also allows adding external widgets and tools to your website via code editing. Unfortunately, Yola lacks a blogging platform, but they make it easy to integrate your Tumblr blog. This is one of the major downsides of the platform. See also: How to create and manage a blog like a pro. Creating a site with Yola starts with template selection. 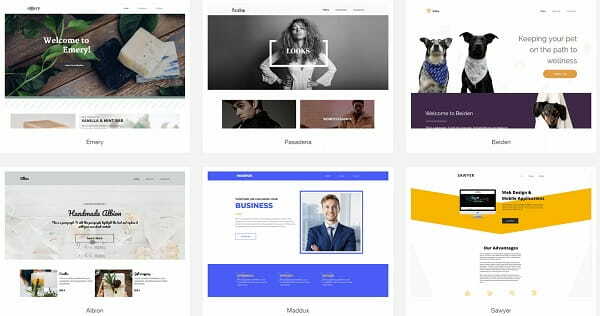 Currently, the website builder offers over 90 templates, which are provided for free and for extra cost. The overall template quality is nice and they are visually-appealing, but they’re somewhat inferior as compared to those designs offered by Wix, uKit and other renowned leaders of the web design niche. The templates are not divided into categories, yet there is an option allowing you to choose a blank template to build a completely unique website from scratch. Yola templates are mobile-optimized to perfectly adapt to different screen sizes and resolutions. As soon as you select the preferred template, you can see its preview version to explore the details. You’ll be asked to specify your website name, its topic, contact info (that will further be added to your web page). The good news is that the way any template looks when you get it from Yola is just the beginning – in the future, you will replace all the default pics, change content layout, modify the footer, upload a new banner etc., if you’re willing to invest your time and effort, of course. Each template is comprised of blocks that can be modified, deleted, added, edited and arranged on a page in the random order. Working with them is not a problem as well. On the contrary, the process is fun and entertaining. Yola templates are switchable. If you feel that your first choice isn’t right, and customizing it isn’t enough, you can simply transfer your content to a new template. Yola customer support is on a decent level and there are several options you can make use of here. Whatever difficulties you encounter, when editing your website, you can take advantage of the Help tab that remains active on all pages in your admin panel. It contains links to the most important places, including Yola community forum, help center, tutorials and training webinars. If you still can’t find the answer, you can contact one of the Yola experts via email or by phone. There is also access to the Instant Help pop up window – the place, where you can type any question you are interested in and wait until the assistant will give you the answer. Another way to get 24/7 support is to type your question in the search filter field and wait for the results the system generates. Are there any problems with your customer support assistance or its quality? Then go ahead to fill out the “Report Abuse” section to let the team know about the situation. To sum it up, customer support is one of Yola’s strengths, which is certainly a notable advantage of the system. Listed above are the discounted prices provided in case you decide to get an annual subscription. The platform offers the 30-day money back guarantee on all premium packages to those users, who are not satisfied with the chosen plan for some reason. What’s more, Yola makes it possible to add a web store to any paid package for $10 per month only. The store will come with all the required eCommerce features and will be devoid of any hidden expenses, transaction fees and other suchlike financial nuances. Finally, you can hire Yola designers and devs to build your website for you – this option starts at $499.95. Working with Yola is engaging and interesting for everyone. 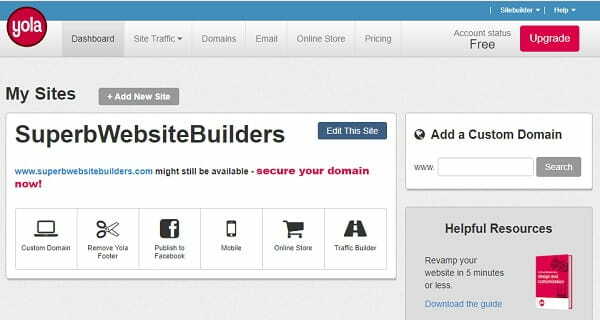 However, just like any other website builder, the system comes with specific merits and demerits its users are bound to know. Let’s have a look at the most distinctive features now. Back in 2007, Yola was a highly popular web service. As time went by, however, the system started lagging behind its closest competitors. Let’s have a brief look at Yola vs Weebly comparison, for example. While Weebly mostly works great for building portfolios, blogs and web stores, Yola is mainly used to launch promo websites and one-page projects. It lacks integrated blogging engine, which is one of the notable demerits of the service. Even though, both website builders are easy-to-use and work well for newbies, Yola still lacks functionality and design customization tools to cover a broad spectrum of web developers’ needs. Weebly also excels in terms of template quality and their mobile optimization, although, it is somewhat more expensive as compared to Yola. Q: Is Yola really free? A: Yes, their Free package is absolutely free. You’re not obliged to upgrade your free account. With your free account you can create a basic website containing up to 3 pages with 1GB bandwidth and 1GB storage. The website will be published to a Yola subdomain. All paid plans come with a 30-day money back guarantee. Q: Are their templates customizable? A: Yes, they are. You can make changes in the chosen template using Yola’s user-friendly What-You-See-Is-What-You-Get editor or by making changes on a code level – there’s an advanced editor for power users. If you know a thing or two about CSS, you can completely rebuild your website and give it a new look. The advanced editing feature is available within Professional and Unlimited packages. Q: Does Yola support eCommerce? A: Yes, Yola has an eCommerce solution. It’s an integration with Ecwid, a leading eCommerce platform which is incredibly popular with other site builders. There are Ecwid widgets in uKit, Webydo and Wix. You can add Yola Commerce to any plan for $10/month. It provides you with functionality such as: product options and combinations; variable pricing for product options like different sizes, colors, models etc. ; inventory management; order and stock management; customer management (users can create accounts and save their payment details); Facebook page store integration; multiple payment methods; promo codes and discounts; tax management and more. Q: Do they offer custom design services? A: Yes, they do. They’ve teamed up with professional designers to offer Yola Premier, a turnkey service that provides you with a professionally designed Yola website. The website will be fully accessible and controlled by you. You’ll be able to make any changes in the design and content. Q: Are Yola websites mobile-friendly? A: In order to optimize your Yola site for mobile viewing, you have to purchase one of the Premium packages. Q: Do they offer any SEO features? A: Yes, they do. There are some free standard settings (meta tags: keywords, description, title) and advanced Yola Traffic Builder. This premium feature will help you understand the core principles of how search engine bots crawl your pages, scan your site for errors and improvements, as well as send feedback on your keyword usage. Yola Traffic Builder will provide you with month-to-month reporting. Q: What are Yola alternatives? A: Yola is undoubtedly a great company, but it feels like they stopped updating the software a few years ago. This may drive you towards a more active site builder, like uKit or Wix. Yola is a website builder, which belongs to the representatives of the old generation of web design tools. It has once been popular as its feature set was enough to cover the needs of the target audience a couple of years ago. The lapse of time triggers the need to look for more full-featured and powerful website builders and it seems like Yola really lacks the required functionality. Having reviewed the website builder, I can’t but have the feeling that Yola stopped updating its software a few years ago. They did release a few new templates throughout previous years, but that’s not enough to withstand contemporary niche competition, which is really tough nowadays. The system really has a number of undeniable benefits like strong customer support and multiple templates, for example. At the same time, the lack of built-in blogging solutions, mediocre designs and high prices may drive you towards the need to look for a more reasonable solution. My opinion may differ from yours, but I don’t think this website builder will work for you, if you have an intention to launch a full-featured contemporary website. This is especially true, when there are so many more favorable alternatives available out there. The choice is up to you now!